On the evening of April 18th, 2015 in Warwick, Rhode Island, a banquet and awards ceremony was held to bring to conclusion an inspirational weekend of brotherhood, friendship and honor – these qualities were the hallmarks of the 1st Genesis Martial Arts International Hall Of Fame. This event marked the first, of what are planned to be annual gatherings, for martial arts practitioners from around the globe. This organization believes in helping others and fostering their growth – as a whole person, not just on the martial arts front. After a thoughtful screening and application process, Soke Keith Kugel, the Founder and President of the organization, hand-selected the faculty of instructors for the inaugural launch of the Genesis Hall Of Fame. The same attention to detail was given to the election of nominees, the casting of ballots, and the execution of an ethical voting process that would ultimately induct individuals into the record books of the organization as Hall Of Fame recipients. 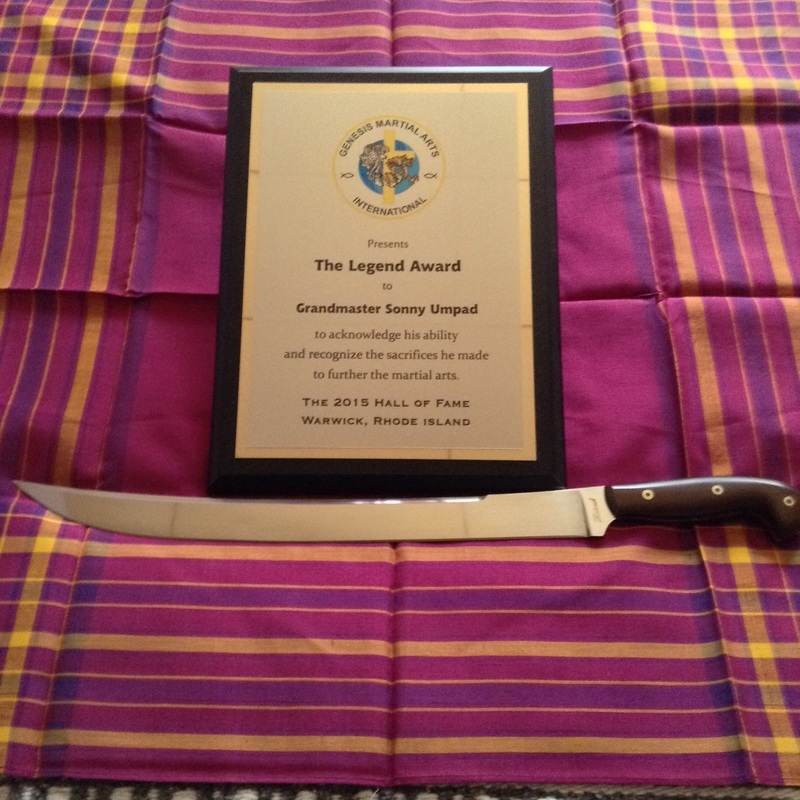 It was a great honor for us, the attending members of The Visayan Eskrima Guild, to accept the accolade that constitutes a lifetime achievement award, as posthumously bestowed upon Grandmaster Sonny Umpad, by Genesis Martial Arts International - The Genesis Legend Award. In expressing the deep-seated feelings of my fellow Founding Plank Holders of The Visayan Eskrima Guild, we are truly blessed to be able to represent the martial heritage of Grandmaster Umpad in both word and in deed. On behalf of our brother Sonny, our cups runneth over. Copyright © 2015 by George M. Yore & The Visayan Eskrima Guild, All Rights Reserved.